This blog post gives context, resources and a plan for inquiry into Indigenous Education in Kindergarten. This is not a week long inquiry. This is a small collection of resources and thinking to support beginning a yearlong, even lifelong inquiry. We all have an obligation to undertake this inquiry to better understand our individual identities and our collective identity as Canadians sharing this land. We must all seek to engage in understanding ourselves first, then to seek to understand, with compassion and respect, those around us, near and far. These materials and ideas are part of this journey and how this may come to life for an educator and for their students in Kindergarten but may also be useful to teachers in the primary grades. May we find joy in this journey. May our youngest students see vibrant communities and strong people first, before they are introduced to the darker sides of our Canadian history that we must all face if we are to reconcile and make peace with the past. Part 1: Part 1 gives the context. This post will begin with my motivation (Part 1-A) for this inquiry and information about the Truth and Reconciliation Commission, particularly the calls to action relating to education (Part 1-B). With some understanding of the TRC and calls to action, I will make connections to the Kindergarten 2016 program (Part 1-C). Part 2: Then, I will list resources including A) books, B) music, C) dance, and D) media that might be appropriate to my Kindergarten classroom and yours too. Many of these resources would be appropriate in the primary grades also. Part 3: I will talk about how I plan to include these in our classroom, starting in September and connecting to Orange Shirt Day on September 30th. September 30 is Orange Shirt Day, the day to remember students of Indian Residential Schools. In 2017 I was new to Kindergarten and I did not know how to address this day with my students nor did I know how I might take action on the TRC. This is my attempt to bring it to our classroom in a way that honours play and inquiry as well as the need to take action with Indigenous peoples. The video below shows the story of preschool children learning about Indigenous issues. Maybe Kindergarten isn’t too young? Also, I have been facing my whiteness and privilege and I have come to realize that diversity is an action word. Make age-appropriate curriculum on residential schools, Treaties, and Aboriginal peoples’ historical and contemporary contributions to Canada a mandatory education requirement for Kindergarten to Grade Twelve students. Provide the necessary funding to Aboriginal schools to utilize Indigenous knowledge and teaching methods in classrooms. Sharing information and best practices on teaching curriculum related to residential schools and Aboriginal history. Identifying teacher-training needs relating to the above. Here are the places where Indigenous education is linked to the Kindergarten program. There are three types of expectations that connect to Indigenous peoples: anti-bias and social comprehension expectations, responding to the arts expectations, and expectations that specifically give Indigenous examples. Overall expectations in the Belonging and Contributing Frame include important expectations centred on anti-bias education. 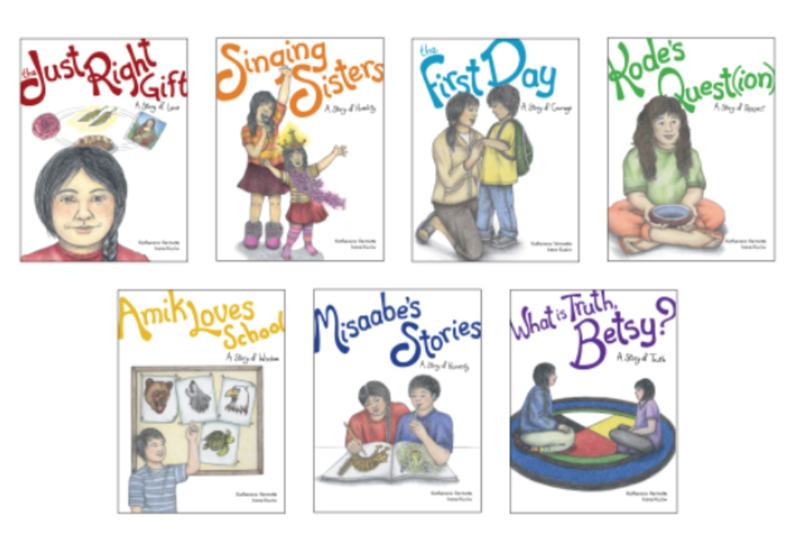 These are a perfect home base for exploring Indigenous perspectives, culture, and identity. The overall and specific expectations that are about responding to the Arts from various cultures would be an excellent place to focus on Indigenous arts. Bringing Indigenous knowledge, culture, and traditions into the Kindergarten classroom is new to me. I think there could be many possible directions that we could go in. Given that this is new-to-me territory, (is that an acceptable pun? ), I want to start by familiarizing myself with materials that are available. I want to see what kinds of ideas and questions these materials might inspire. I want to highlight Indigenous people of Canada in the present tense. Why? I do not want to reinforce or introduce stereotypes in the type of a museum indian. I feel awkward saying museum indian, but I want to sketch out a picture of an Indigenous person represented in a historical context wearing ceremonial clothing. When I say museum indian, I hope that makes a picture in your mind which is of a person that is quaint and historical and does not exist today. If the words make you uneasy, like they do for me, then I think you get the idea of what I am hoping to avoid. By focusing on this type of image, I think it would be like studying White Canadian’s of European descent only in terms of their pioneer and early settler ancestors. 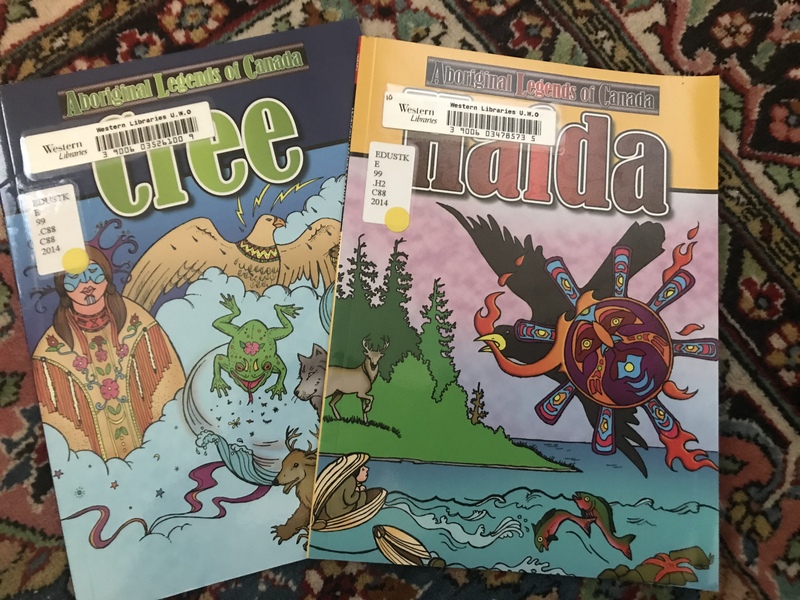 Growth Chart Literacy Prompts is a resource created by ETFO with books and lesson plans relating to First Nations, Metis and Inuit peoples and cultures. Wild Berries by Julie Flett and Early Cook and Lessons from Mother Earth by Elaine McLeod and Colleen Wood are included in this resource with summaries, prompts and activities. This is a character education series is available for purchase here. 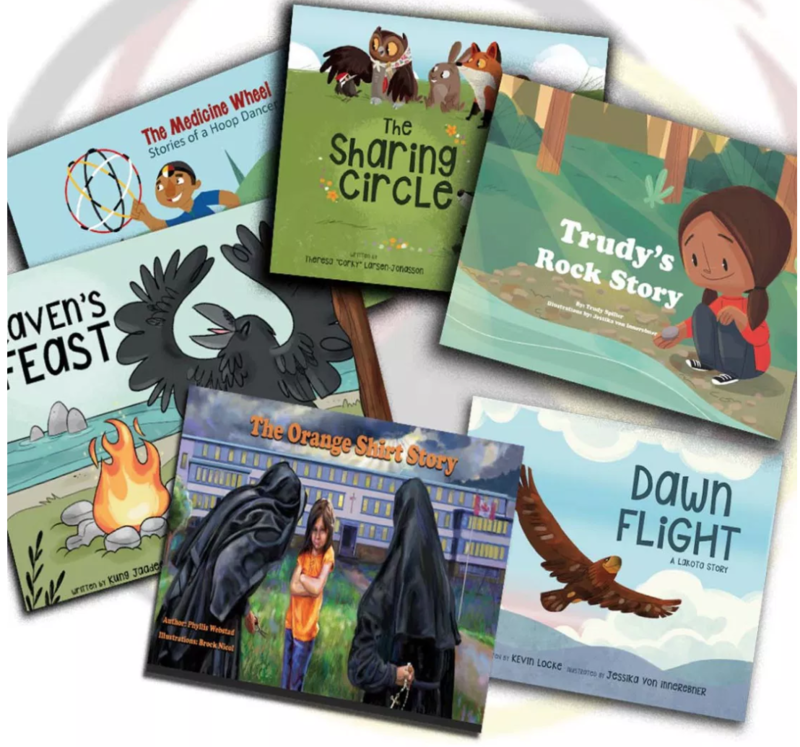 The stories are based on the seven Indigenous teachings: love, humility, courage, respect, wisdom, honesty, and truth. Each of these values are represented by an animal and these animals are characters in the story. There are many stories and legends in which elders tell how things came to be the way they are in this world. 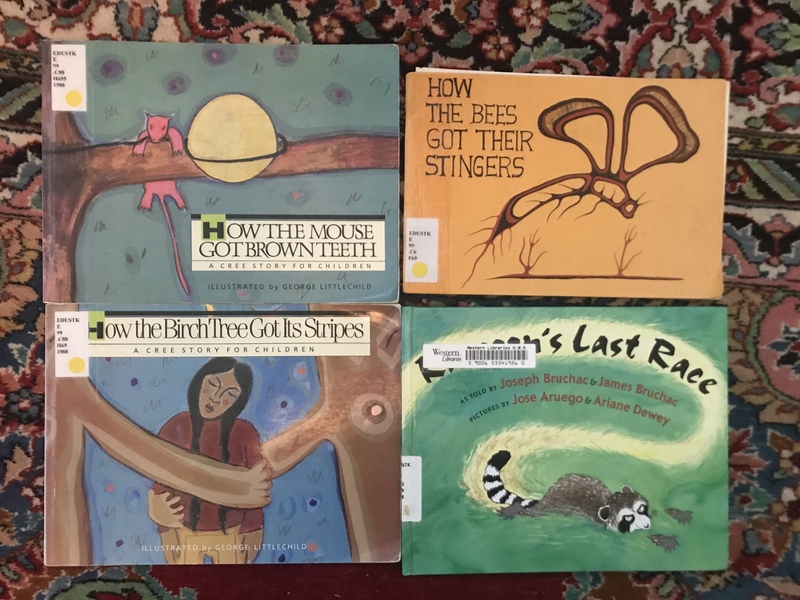 Racoon’s Last Race: An Abenaki Story about how the Racoon came to look a certain way. Here are two pictures of books from this series. Here is a playlist of Canadian Indigenous artists. This song is first for a reason, I could listen to this all day. It’s so good! Susan Aglukark is an Inuk singer and was born in 1967 in Churchill, Manitoba. She is a folk and pop singer. The video The Child is footage of traditional dancers at a Pow wow. This one is the Tsuu T’ina Pow Wow and Rodeo in Bragg Creek, Alberta. Tanya Tagaq is an Inuit throat singer. She was born in 1975 in Cambridge Bay in the Northwest Territories that is now Nunavut. This video can be for Educator background knowledge or to show clips to students. Let’s Have a Party was performed at the closing ceremony for the 2010 Olympics in British Columbia, Canada. Derek Miller is an Indigenous guitarist, singer, and songwriter. He was born in 1974 on the Six Nations reserve near Brantford, Ontario. To learn about more Indigenous music, check out the Indigenous Music Awards website. One more music video to share, just for Educators. This is Gentle Warrior. For more information about this song, click here. 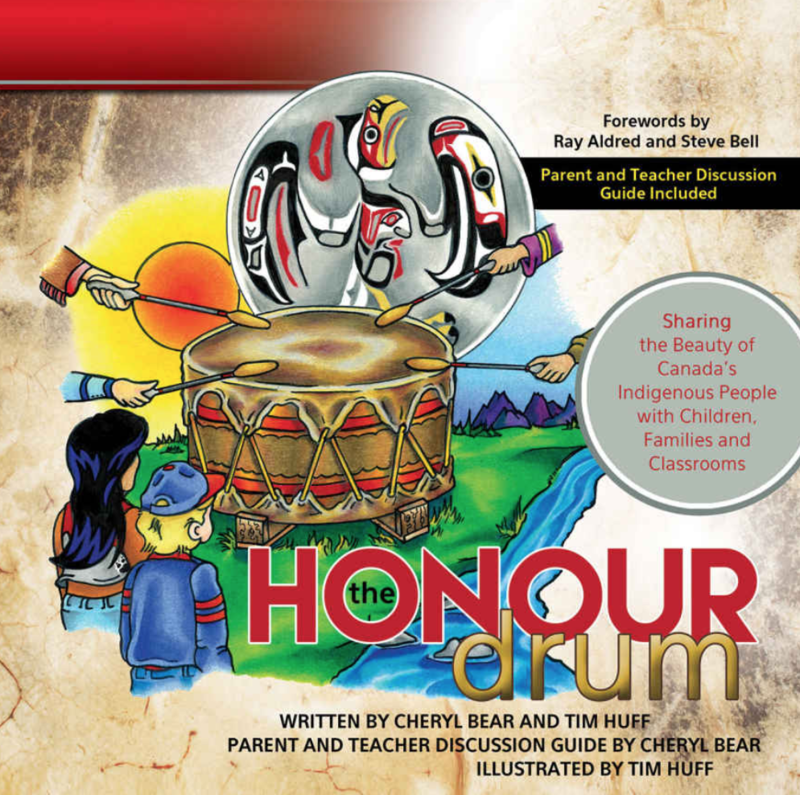 Honour the Drum is a picture book. It’s a rhyming poem with a stanza on each page. I think just the poem would be great for Kindergarten, but there is a lot of information for each stanza including discussion questions that could be good for educator background knowledge or for the grades. The Native Drums website also has a wealth of information about drumming. Tom Jackson is an Indigenous musician and below you will hear him sing Huron Carole, it’s a native nativity song. Here is the Huron Carol song by Mi’kmaw in the Algonquian language, Mikmawisimk. I want to find more songs that are song in English and an Indigenous language too. I love this so much. I’m never doing Just Dance videos on YouTube ever again! Powwow Sweat is a combination of Just Dance and Go Noodle. The videos feature Indigenous kids in shorts and T-shirts showing the steps to traditional dances. The videos often include footage of dancers in traditional and ceremonial costumes. They. Are. Amazing. Powwow Sweat is created by The StyleHorse Collective. Here is a sample of the videos. The first one is the step-by-step instruction video for the Jingle dress dance. Followed by a video of the Jingle dress dance where there is less time for instruction. For more on dancing, check out Native Dance here. Most of the material is for grades 4-12 but would be good background information for educators of younger children. The Mountain of Sgaana tells the story of a hunter who travels to the magical underworld of the ocean. The full length (10 minute) cartoon can be seen on the NFB website here. The National Film Board has many videos, I think this one is best for Kindergarten. Legends of the Northwest Coast Indigenous peoples are beautiful told in this series, Raven Tales. The complete series is available at the library in my city, check your local library! The clip shown below gives you a sense of the animation and stories. This story would be great to share in the winter, the season best suited for story telling. I did not include media literacy expectations, but now that I think about it, that could be another curricular connection. My goal is to first integrate books, music, dancing etc from the cultures of the children that are represented in our classroom. I want to start by including the languages and songs of the children I teach. I want to learn about and introduce legends and fairy tales that originate in the cultures of the children in the classroom. Then, over time and bit by bit, I want to introduce books, stories, music and dancing of Indigenous peoples. I suspect and hope that children will explore these roles/identities in dramatic play. It’s key to notice and talk about differences, but there are friendly and unfriendly ways of doing this. Noticing differences in unfriendly ways can be unsafe for some people. It’s okay and encouraged to notice and discuss differences, but there is a friendly and unfriendly way of doing so. Unfriendly ways of noticing differences can be unsafe for some people. The video, Big Mouth, could be a great video to show students and talk about how we might talk about our differences. Developing a deep understanding of their personal identity. Talking about differences in friendly and safe ways. Asking questions about people, in friendly and safe ways. Seeking to understand how different people live and celebrate. Dramatize legends and stories from cultures around the world. Create and respond to art works (visual, musical, movement, dramatization) that reflect various cultures. For Orange Shirt Day on September 30, we will not yet have had enough time to really dive into the culture of the children represented in the classroom. But, I hope to have done a couple of Powwow Sweat videos and talked about Indigenous peoples. I plan to wear orange and tell my students why I am wearing the colour orange. Children will be invited to wear orange too. I will explain why in a developmentally appropriate way for Kindergarten and without making it sound too scary. Over the course of the year, I hope to bring in many of these resources as part of a wider goal of anti-bias education and indigenous education in the classroom. I would love your feedback and to hear your ideas of what this will look like in your classrooms. Thank you to my Kindergarten AQ ETFO instructor Leah Kearney and ETFO AQ since this blog comes from assignments and thinking that I engaged in as part of completion of assignments in the course. The prompt was to focus on inquiry, and I decided to work on learning more about resources that would support inquiry into Indigenous peoples. Thank you to VoicEd Summer Book Club and #SevenFallenFeathers I came across your chat one night on Twitter and was glad to get another book recommendation and see people who were interested in this conversation. Thank you Debbie Donsky , Pamala Agawa , Laurel Fynes and anyone else who is thinking about the TRC and taking action.